Joost Gieskes, horticultural historian, dendrologist, author and former officer in the Royal Netherlands Navy, is fascinated by Japanese garden art. The Japanese garden in Clingendael Park in Wassenaar near The Hague, which was declared a National Monument in 2001, is his special favourite. 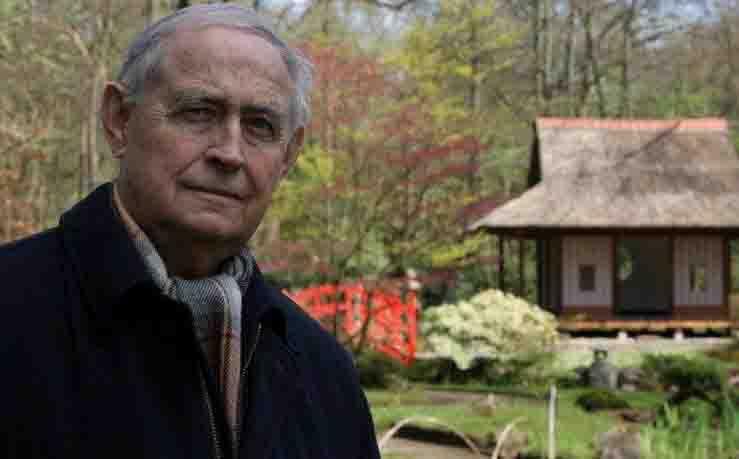 "When I started studying the history of the Clingendael estate, I soon discovered the Japanese garden that forms part of this beautiful park. It did not take long for this jewel in het crown of Clingendael to become the focus of my attention, and over the years I have quite fallen in love with it." Joost Gieskes became interested in gardens through being stationed in England for 3 years with the Dutch navy and his voyages to the Far East where he came into contact with oriental culture. His contacts with the various Dutch associations devoted to the history of gardening and his membership of the Royal Historical Society in England also influenced his development. "My stay in England,where I saw so many beautiful English gardens, sparked my interest in horticulture. I was greatly impressed by the English landscape. This was a few years before I retired from the Dutch navy (which has compulsory retirement age of 50). After that, I began my studies on the history of gardening, where I gradually focused on the Japanese Garden." "Research is in my blood"
The Japanese Garden in Clingendael was created in 1913 at the initiative of Marguerite Mary Baroness van Brienen van de Groote Lindt (1871-1939), normally known as Lady Daisy. The Japanese Embassy in The Hague probably provided advice concerning the lay-out of the garden. The garden's centenary was celebrated in 2013. Joost Gieskes had researced the history of the Japanese Garden in detail,which gives him a uniqe position as the garden's chronicler. "Research is in my blood," he comments. In 2005 he published a slim volume entitled "De Japanse Tuin in Clingendael, Kroniek van een mysterieuze tuin" (The Japanese Garden in Clngendael, Chronicle of a mysterious garden). This book describes the development of the garden from the beginning, and also gives full details of the history of cultural relations between the Netherlands and Japan. Joost Gieskes has also published articles on the history of the 17th-century Clingendael estate and the neighbouring Oosterbeek estate, together with a series of articles on the philosophy underlying the restoration of historic gardens and a brief history of Clingendael, which appeared in Cascade, Bulletin voor tuinhistorie in 2009. This last-mentioned essay described how the Clingendael estate has changed hands over the centuries, through inheritance and sale. Clingendael Park attract many visitors every year; many come especially to see the Japanese Garden. The cultural links between the Netherlands and Japan are relevant in this connection. The 400th anniversary of relations with Japan was celebrated in the Netherlands in 2000. "The long period of commercial links between our two countires date back to 1600, when the first Dutch traders arrived in Japan," Joost Gieskes explains. "When Japan closed its borders to foreigners in 1639, it made an exception for the Netherlands and a small Dutch trading post was allowed to to remain in Dejima, a small artificial island built in the bay of Nagasaki. The fact that all other nations were cut off from Japan for centuries gave this country an air of oriental mystery, and foreign interest in Japan mushroomed in the19th century, leading to a real craze for all things Japanese. 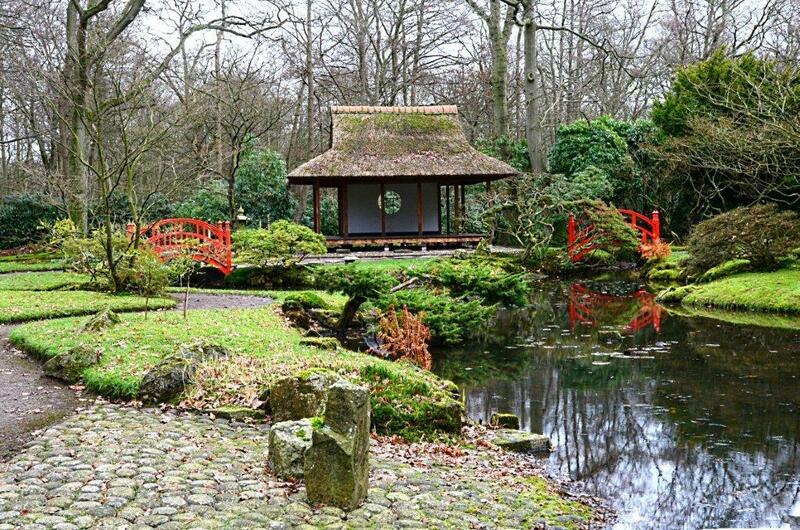 The Japanese Garden in Clingendael owes its existence to this curious historical trend." A garden like a museum, full of symbolism. The water basin with four Buddhas round the sides, which was acquired in 1971,flanked by a lantern. The bamboo ladle on top of the basin is used to scoop up water. In his essay Joost Gieskes described the symbolism used in Japanese gardens and Japonism - or Japonaiserie as Vincent van Gogh called it - the cultural movement that spread like wildfire through Europe in the 1860s and was stimulated by the display of many Japanese woodcut prints at international art exhibitions. 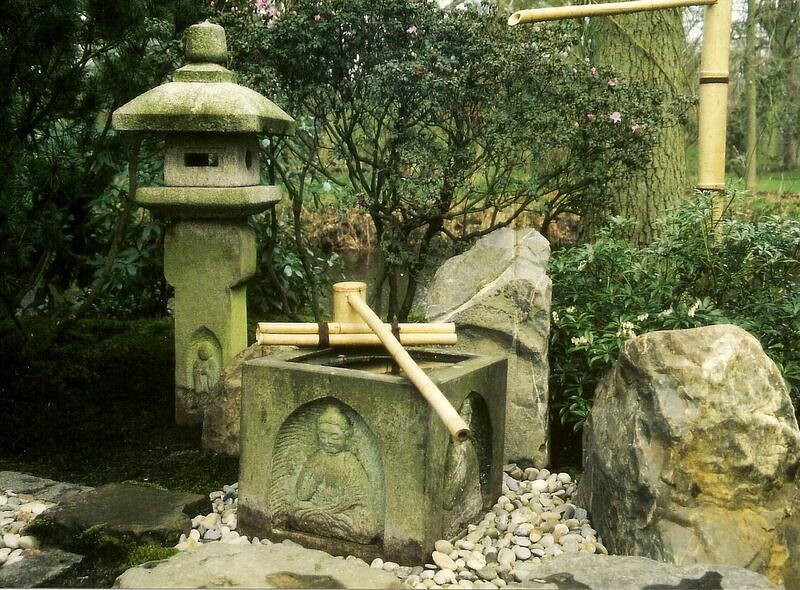 Gieskes also had a lot to say about the symbolism used in the Japanese Garden in Clingendael. "The garden is like a museum," he claimed. "Much of the symbolism here is to be found on the various lanterns placed here and there in the garden and the two water basins. The lanterns are often decorated with Buddhist symbols, such as deer. Certain features of the garden are also symbolic. For example, the island in the ornamental lake that forms part of the garden is called the 'Turtle Island', though this is more the product of human imagination than of symbolism. The trees in the garden are symbolic too. For example, the cherry trees that flower early in the spring are the symbol of the brevity of human life, while the bamboo and the pine trees stand for longevity. Oriental culture has many other symbols of longevity, such as the turtle and the crane." The little statue at the back of the garden is an image of the Buddhist saint Jizo, the protector of children. The bridges in the garden are painted bright red, the colour of joy, but this red colour was also considered in Japan to ward off evil spirits. There are two water basins, one with four images of the Buddha on it and the other in the form of a lotus flower. In the original Japanese setting, this water is scooped up with a bamboo ladle for ritual cleansing of the hands and mouth before praying (see above photo). The little shrine in the Japanese garden used to contain an image of the Buddha, but unfortunately this has been stolen. It has been replaced by a Jizo image purchased by the municipality of The Hague. 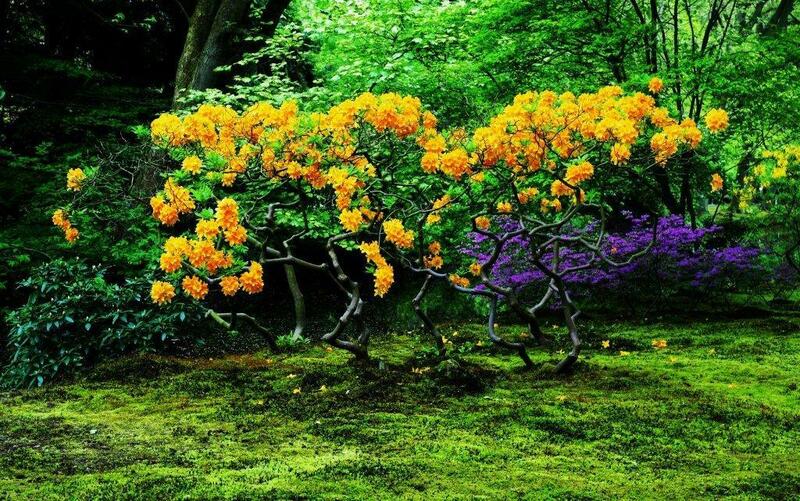 The story of the Japanese Garden in Clingendael Park begins with Lady Daisy, an enterprising, versatile and active noblewoman whop remained unmarried throughout her 68-year-long life. She inherited the estate from her father, Baron Arnoud van Brienen and was the last member of the family to own the Clingendael estate. She spent much of her time in England, and during the First World War she made the estate available as a hospital for wounded British and Canadian soldiers. In his study of the Japanese Garden, Joost Gieskes states that it is quite possible that Lady Daisy got the idea for the garden through her close contacts with the English aristocracy, where Japanese-style gardens had been in vogue well before she had one laid out in Clingendael. The pavillion with a red bridge on each side. Joost Gieskes, who called Lady Daisy "a bright, enterprising woman" in his book, does not exclude the possibility that she might have played a large part in the design of the Japanese Garden herself, since it is known that she designed the Dutch Garden in Clingendael herself in 1915. It may be noted that the term "Dutch Garden" here refers to the British concept of a Dutch garden. The Japanese Garden has occupied a unique place in Dutch horticultural history right from the moment of its creation, since at that time it was the only Japanese garden in the Netherlands. It contains splendid, rare treees and plants, extensive areas of moss that require meticulous maintenance, a carefully cultivated network of paths with stepping-stones through the artificial lake and three interesting buildings: the pavilion, and a waiting house - initially designed as part of the Japanese tea ceremony. The garden is only open for a limited period - six weeks in the spring and six weeks in the autumn - because of the fragility of the vegetation - particularly the moss - it contains. It is of great historical value, and attracts a large number of visitors every year. "You could say that the garden is a past with a future," joked Joost Gieskes. "It has an illustrious past, and it has a future that has to be preserved by all possible means, by proper upkeep. Apart from its value as a cultural relic, it is there to be enjoyed by the countless visitors." Joost Gieskes, who has amassed a large collection of books on the history of gardening over the years, muses, "I have gradually turned into an expert on gardens, a horticultural historian." The deciduous, scented yellow Rhododendron luteum, flowering in spring. Joost Gieskes has described the origin of the Japanese Garden as a mystery because so much documentation has been lost. This is largely due to the activities of the German occupying forces, who took over the Clingendael estate during the Second World War. "It was discovered after the War that the entire historical archives of the Van Brienen family had been lost. Despite this tragic event, we have to do our best to unravel certain matters concerning the estate. This lack of documentation is one of the reasons for the mystery surrounding the garden." Tradition has it that Lady Daisy, who enjoyed holding garden parties, athletic contests and even concerts on her estate, visited Japan round about 1895, and that this visit bred her liking for Japanese gardens. She may have brought a number of ornaments back with her from ths trip, such as little bridges, an image of the Buddha and other small statues, various stone lanterns and a water basin, other garden accessories and rare plants. It is most likely, however, that these objects were brought back in 1911, when there is defintie evidence that she visited Japan. "Lady Daisy brought a number of objects back from Japan," said Joost Gieskes. "We know that from studies of the history of the garden, and from the published reports of a journalist who visited the garden in 1925. A number of stone lanterns were ordered by the municipality of The Hague in subsequent years, and details of these orders have been preserved. Gieskes discusses the secrets of the magnificent Japanese Garden wth a mixture of historical acumen and awe. "The origin of the pavillon was also a mystery. As in many traditional Japanese houses, the floor is covered with rush mats with standard dimensions of roughly 60 x 90 cm. The pavillion in the Japanese Garden has typical Japanese dimensions, and looks very Japanese. It contains typical Japanese sliding panels. Any garden needs to have a natural focal point, and in the case of the Japanese Garden in Clingendael the pavillion performs this function. Lady Daisy often sat there, as shown by old photos on which her chair may be seen. The waiting house may also have been brought back from Japan by Lady Daisy. This building is intended to play a role in the Japanese tea ceremony: it is where guests wait until the host comes to fetch them for the tea ceremony proper. However the garden has been designed as a stroll garnde. The garden also contains a shrine and a long, relatively narrow artificial lake. The garden has three entrances, one of which has been specially adapted by the municipalityu to permit disabled access. A number of the paths in the garden have also been made suitable for wheelchair users. 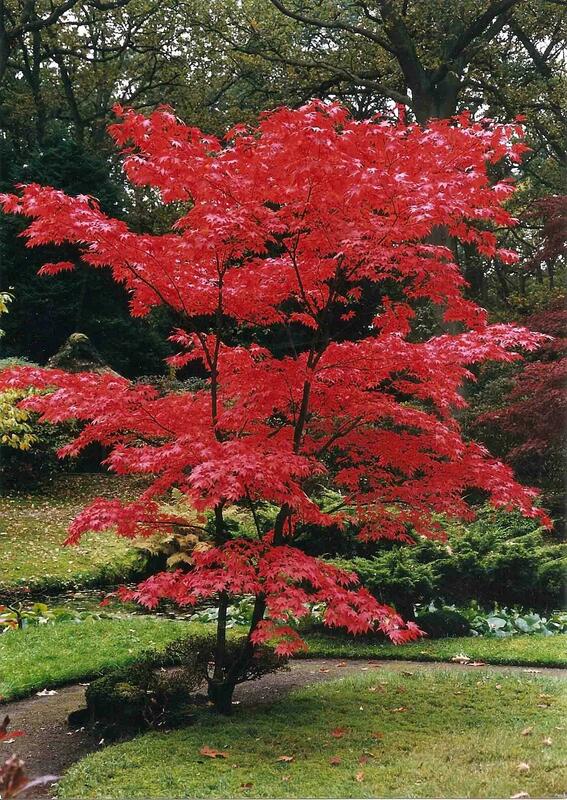 The garden offers a splendid variety of trees and plants: cherry trees, which give a magnificent display of blossom in the spring, maples with their delicate colours, rhododendrons and azaleas. There is also a lot of bamboo, which is green all year round, ferns and wisteria. The Japanese Garden in Clingendael is similar in style to those created in the late 19th and early 20th century by English travellers who visited Japan during this period. Most of these were big landowners. Some of them brought back a Japanese gardener, but they often gave their own interpretation to the garden rather than following Japanese models strictly."